Iona Blog : Joanne McGillivary- One to Watch! 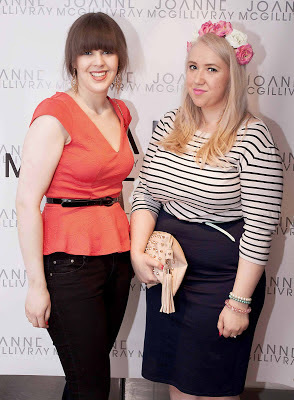 A couple of weeks ago I was lucky enough to be invited along by Rachel at Hartmann Media to the launch of 2012 Scottish Fashion Graduate of the year Joanne McGillivary's inaugural collection. Joanne's collection is called Russian Revolution and features a rich colour palette and beautiful prints inspired by Russian tapestry. Russian Revolution is an Autumn Winter collection, inspired by a trip to St Petersburg, Russia; Joanne was fascinated by the history in the city. I love the story behind the collection, especially as I long to visit Russia one day. Not usually the first choice on most peoples holiday wishlists, but I am fascinated by the vastness and history of Russia. The launch was held at 29 Private Member's Club in Glasgow, it was my second time there I'd been before for an INAA Hair and Beauty Awards pre-event, this time my friend Ami and I had time to have a cocktail in the bar downstairs first, before heading upstairs for canapes and prosecco before the show. Sadly my picture's didn't turn out as well I'd hoped they would, but I hope they give an idea as to how gorgeous the collection is, my favourite pieces were the dark teal palazzo pants and the mint crepe dress with brown leather waistband. I'm not sure if I could pull off palazzo pants, but they are so chic and looked incredible on the model. I also loved the styling of the hair and make up, all in all it was a really impressive show. These trousers are stunning, sadly the blur-tastic picture doesn't do them justice! The middle dress is my favourite, such a perfect style which would suit so many body shapes. Cake Push Pops from Cake Cetera, we enjoyed one of these on the train home! Joanne is definitely one to watch on the young Scottish designer front, her pieces are stunning! It was lovely to catch up with a few of the lovely ladies I know from blogging and enjoy a few glasses of bubbly whilst looking at all the prettiest dresses, a perfect Thursday night. My lovely friend Ami and I. Looks like you had a great time! :P i really want a cake pop hahaha I love the hair its so gorgeous!